Art is my true passion. It all started at a tender age when, as a child, I preferred sitting quietly at home drawing instead of going out to play with my friends. I used to sit anywhere to draw freehand anything from memory, my game was to “get it right”. This proved to be an excellent exercise, just perfect to educate my hand to draw well. My favourite subjects have always been people and pet portraits, although I also like to paint flowers and still lifes. I attended Gazzola Art school in my home town as well as the Cova institute in Milano, where I learnt to paint trompe l’oeils and mural decorations and I have been successfully working as a muralist and a portrait artist ever since. I currently enjoy painting custom portraits of people and pets as well as creating fantasy pet art, depicting cats and dogs in a a soft, sweet and romantic serie of artworks with an interesting blend of imagination and realism, providing a peaceful refuge from this frantic life. My portraits as well as my floral still life paintings are created using the finest pastels on acid-free cotton pastel paper. 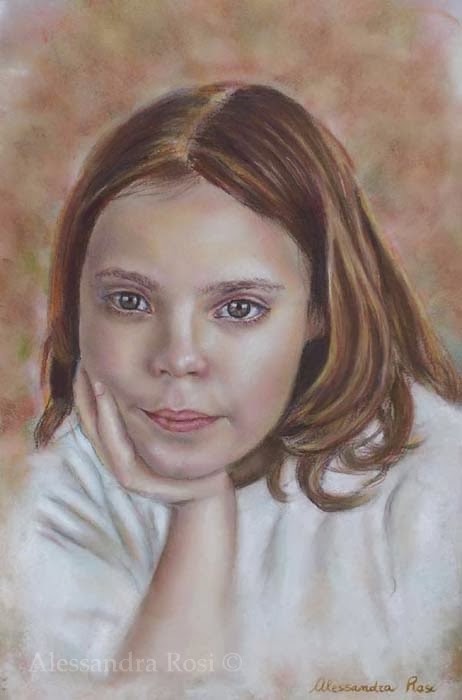 Pastel is my favourite medium because I find it ideal for capturing the delicate subtlety of the human face, pets fur and flowers petals, with a very soft finish that is quite distinctive of my portraits. I love admiring the beauty of nature, seeing flowers in bloom with the arrival of spring gives me such a joy and fills me with a sense of excitement because of the gorgeous colours and perfumes, that I naturally want to absorb that positive sensation and try to translate it into my floral paintings. I am also a true animal lover, I have an adorable dog that fills my days with his trusty and affectionate company and so he holds a special place in my hearth. I think pets enrich so much our lives, with their sincere devotion and faithfullness, that I can't help but being drawn to paint them, wether in a pet portrait or as a subject for my fantasy animals paintings. The ultimate aim of my art is to make people feel good while lifting them out of this world into a much more relaxed, pleasant one.